The Director, Federal Highways, South South Zone, Mr Godwin Eke, has said ongoing rehabilitation of Aba-Port Harcourt dual carriageway is strategic to economic development of South-South and South-East states. The construction of the 414-kilometre Aba-Port Harcourt dual carriageway, valued at N40.35 billion and awarded in Jan. 24, 2015 to CCECC Nig. Ltd., a Chinese firm, is expected to be completed in 2020. Eke also said the Aba – Port Harcourt expressway, linking Rivers and Abia, was also strategic to the economy of the two states. He said that funding for the project, derived from Sukuk and appropriation budget, would endure over the years until completion. He said that the ministry was on top of challenges delaying construction and rehabilitation of that section of the road. He said the challenges included flooding from Imo River and demands for compensation from communities traversed by the project. He said that the completion date for that section of the road could be extended if it was not realisable. He said that no fewer than 180 workers had so far been employed by the contractors handling the construction of that section of the road, which is 1.2 metres wide and 1.95 metres deep. 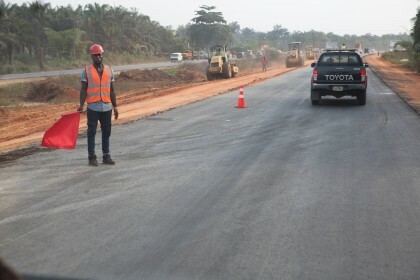 Mr Johnson Fadire, the Federal Controller of works in Rivers, told our reporter that although the contractor was fully on ground, the Aba-Port Harcourt road completion was currently at 5.5 per cent. Fadire said that CCECC, the main contractor, could not take off until March 2018 because the road needed to be expanded from four to eight lane as well as issues from host communities. He said that the section from Imo River to Port Harcourt was critical, adding that stabilisation work including hydraulic structures and pavement, surface and other ancillary work were ongoing. Mr George Gao, the road’s Project Manager, also said that other challenges included preponderance of heavy duty vehicles on that axis of the road and traffic snarl. According to him, the company is awaiting approval from relevant authorities on compensation issues. The company was expected to give 50 years warranty upon delivery of the project.